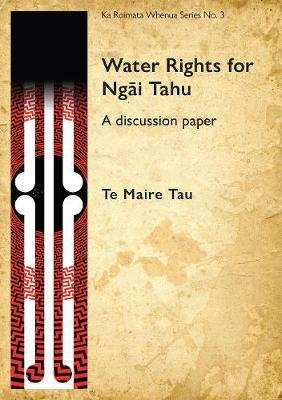 In this short book Te Maire Tau lays out the historical background and context to water rights, and opens a discussion about where to proceed next in determining a Ngai Tahu position on water. There is perhaps no issue in New Zealand today more contentious than water rights. The Crown claims that no one owns water, but its use, irrigation and treatment are controlled by local governments empowered by the Crown. Since the 1990s resource consents for the taking of water, in Canterbury and Southland especially, have increased dramatically and the environmental situation is reaching a breaking point. After years of discussion some kind of system regarding the ownership of water is inevitable. In Water Rights for Ngai Tahu, Te Maire Tau considers the historical and political framework that has contributed to the current state of water rights in the Ngai Tahu takiwa. He explores the customary, legal and Treaty frameworks that feed into the debate regarding the ownership of water. From 1844 to 1864 the Crown purchased more than 34.5 million acres of land from Ngai Tahu, but in most purchase deeds water is not mentioned. How does this play into claims to water? Should the Treaty be relied upon? How far can kaitiakitanga take us if the goal is mana motuhake and tino rangatiratanga? In this short book Te Maire Tau lays out the historical background and context to water rights, and opens a discussion about where to proceed next in determining a Ngai Tahu position on water. Dr Te Maire Tau is one of New Zealand's great tribal historians, a leader of his hapu, and a strong voice in the rebuild of Christchurch following the earthquakes of 2010 and 2011. He helps to build relationships between indigenous people around the world. Te Maire is the director of the Ngai Tahu Research Centre at the University of Canterbury, and also holds the highly respected position of Upoko (head) of the Ngai Tuahuriri hapu in Canterbury. Having always harboured a passion for history, Te Maire was a student at Canterbury University when he uncovered manuscripts in the Alexander Turnbull Library that helped him to piece together the story of Ngai Tahu's migration from the North Island's East Coast to the South Island in the 18th century. As a specialist historian on oral traditions, tribal genealogies and indigenous knowledge systems, Te Maire helped iwi leaders with their land claim to the Waitangi Tribunal. He was also an expert witness and historian for the settlement of the Ngai Tahu claim - the largest settlement in its day between Maori and the Crown. Te Maire is the author of a number of publications dealing with oral traditions and the relationship between indigenous knowledge systems and how they intersect with Western science.